Image: Charley Gallay/Getty Images for SAG-AFTRA Foundation. On Nov. 8, Lady Gaga was forced to evacuate her Malibu home due to the Woolsey Fire, but that isn’t stopping her from giving back to her community. 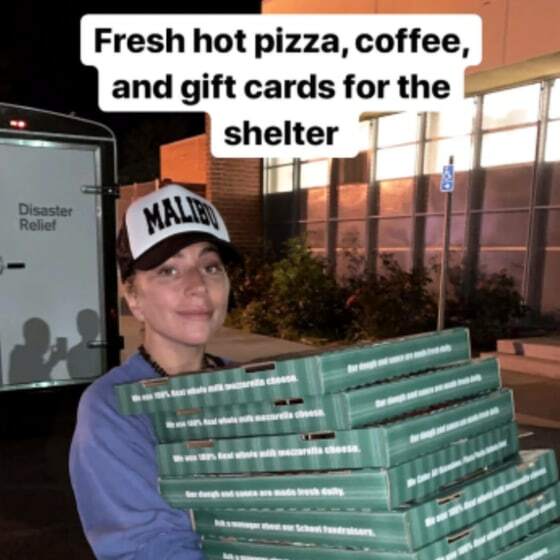 On Tuesday night, Lady Gaga delivered 11 boxes of pizza, coffee and gift cards to one of the many evacuation centers around Los Angeles. Why Tuesday? Simple. It was her “favorite day of the year”: World Kindness Day. “I encourage you all to do one act of kindness, even if it’s for yourself,” she said in a video posted on Twitter on Tuesday. It doesn’t end there. Earlier, she also stopped by a Red Cross shelter at Pacific Palisades High School to hand out gift cards, take photos and speak to the crowd about mental health according to the Daily Mail. Gaga even sang to a 98-year-old woman who was also displaced from her home. The day after Gaga was evacuated from her Malibu home, she took to Twitter to share her thoughts about the deadly fire. “I am thinking so deeply for everyone who is suffering today from these abominable fires & grieving the loss of their homes or loved ones. I’m sitting here with many of you wondering if my home will burst into flames. All we can do is pray together & for each other. God Bless You,” she wrote. According to the California Department of Forestry and Fire Protection, the Woolsey Fire is now over 98,000 acres and 69 percent contained. For those in areas affected by Woolsey Fire or Camp Fire, Cal Fire has shared a graphic with information lines and websites you can call or visit. For those who want to help, you can follow Gaga’s lead and visit Red Cross’ website or call them at 1-800-RED-CROSS to make a donation. You can also text CAWILDFIRES to 90999 to make $10 donation.